One of the most exciting aspects about international travel can be the simple joy of sampling new desserts. If you’re a globetrotter with a sweet tooth, you know I’m speaking your language. In the following article I’ve compiled an assorted list of scrumptious confections from around the world. If you’re currently not traveling, no need to feel left out. I’ve included the complete recipe for each dessert featured; this way you won’t have to journey any further than your own kitchen to enjoy these tastes from around the globe. Chinese migrant workers first introduced banana plants to Queensland in the 1800s. Since then, the taste of this sweet pulpy fruit has become an Australian favorite. 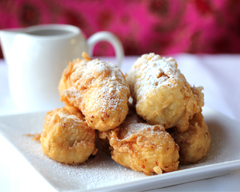 The banana fritter is not only delicious, it makes for a low-fat , high-fiber dessert. First, in a large bowl mash the bananas. Mix in milk, eggs and margarine until it’s completely smooth. In a separate bowl, combine the flour, sugar, baking powder, salt, cinnamon and nutmeg. Stir these dry ingredients into your banana mixture. Next, heat the oil in a deep fryer or heavy bottomed pan to 375 degrees F or 190 degrees C. Drop batter by spoonfuls into hot oil, and cook, turning once, until browned 2 to 8 minutes. Drain on paper towels and dust with confectioners’ sugar. This may not be the prettiest dessert but they sure are tasty. Brazil is the fourth largest producer of coconuts in the entire world. 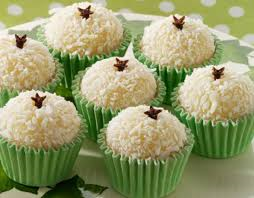 With those sort of statistics, it’s only fitting that I feature the coconut truffle as this South American country’s favorite dessert. First mix the coconut milk and the honey in a medium sauce pan. Bring the mixture to a boil and allow to simmer for about 2 hours, stirring occasionally . You will notice the mixture thickening during the 2 hours. It should become thick enough that it doesn’t run off the spoon easily. Next, add the butter, vanilla and the shredded coconut. Cook for about 5 minutes stirring constantly so it doesn’t burn. When the mixture starts releasing off the bottom of the pan with a very thick consistency, remove from the stove and allow to cool. Next, place the mixture in the fridge for 2 hours. It’s very important it completely cools before you roll. After the allotted time, remove from fridge. Using your hands, start rolling the truffles into balls. Lastly, roll each ball in shredded coconut to make approximately 20 truffles. The date palm is the most abundant tree in Egypt. These magnificent trees produce over a million tons of fruit each year. With this many dates, I just have to feature them in this Egyptian dessert. 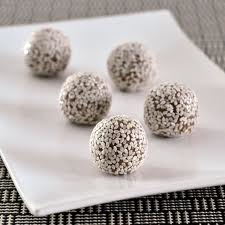 The almond tahini date ball is one sweet treat that’s truly fit for a pharaoh! First, grind almonds and cinnamon in food processor until finely chopped. Add the tahini and continue to pulse. Next, add dates and a pinch of salt. Chop until mixture is completely blended. Form into 1″ balls, roll into sesame seeds to coat, and refrigerate. Almond Tahiti Date can be eaten at room temperature, but I find that they are best served chilled. 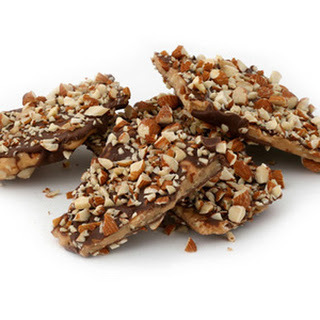 Chocolate and almonds compliment the rich buttery flavor in this gorgeous British treat. Growing up, this toffee was one of my mother’s favorite Christmas-time candy recipes. A candy thermometer is recommended when making this toffee to ensure the mixture reaches a hard crack stage. First cover a large cookie sheet with aluminum foil or parchment paper and set it to the side. In a heavy skillet, over medium heat, melt butter. Stir in sugar. Heat mixture, stirring constantly until sugar begins to golden or become caramelized ( 300 degrees F or 150 C). Upon reaching the correct temperature, remove from the heat and stir in vanilla extract. Pour the mixture onto the prepared cookie sheet spreading the toffee evenly. Immediately sprinkle the chocolate chips on top. Allow the chocolate chips to sit atop the toffee momentarily until it begins to melt. Utilize the back of your mixing spoon to spread the melting chocolate in a consistent layer across the toffee. Sprinkle the nuts . Let cool completely in the refrigerator before breaking into pieces. 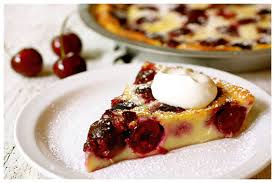 The French dessert, Clafoutis, meaning “to fill”, has an origin that traces back to the rural region of Limousin. This scrumptious treat, consisting of sweet cherries suspended in a pancake-like filling, will have you saying “oui” for another slice! First, preheat the oven to 325 degrees F(165 degrees C). Grease a 10 inch tart pan or a similar sized baking dish. Spread out the cherries in the bottom of the prepared pan then set aside. In a small bowl, whisk together the flour, salt and sugar. In a medium bowl, whisk together the egg whites, milk and cream. Stir in the cherry brandy and vanilla extract. Gradually whisk in the flour mixture until smooth. Now take your complete mixture and pour it over the cherries. 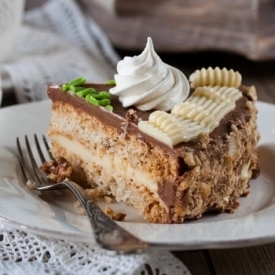 Many assume this cake was named after the Black Forest mountain range that sweeps across southwestern Germany. It’s actually inspired by the specialty liqueur flowing through that same region. The ingredients, cherries and alcohol, give this spirited sweet a very distinct European flavor. First, preheat oven to 350 degrees F (175 degrees C). Grease and flour two 8 inch cake pans. Make the milk sour by mixing in the vinegar. Set aside. Take a medium sized mixing bowl and chill in the freezer (used later for whipped frosting). Next, sift together the flour, sugar, cocoa powder, baking soda, baking powder and salt in a medium sized bowl. Set aside. In a large bowl, whisk together the eggs, oil, coffee and vanilla. Stir in the sour milk. Gradually beat in the flour mixture, mixing just until fully incorporated. Next, pour batter into prepared pans. Bake in the preheated oven for 30 minutes, or until a toothpick inserted into the center of the cake comes out clean. Allow cake layers to completely cool on wire racks before adding filling. For the cherry filling: Combine the cherry pie filling and cherry liqueur. Refrigerate cherry mixture until chilled before adding to cake. For the whipped frosting: Removed the chilled mixing bowl from freezer. Add chilled heavy cream and confectioner’s sugar. Beat at a high speed until the mixture forms stiff peaks. Remove 1 1/2 cups of the whipped frosting and set it aside. Once the cake layers have cooled, remove from pans and set on wire racks. Using a long serrated knife, split cakes horizontally creating four layers. Take one of the layers and crumble into a small bowl. Set aside. Next, gently brush the loose crumbs from each cake layer. Place the first remaining layer on a plate and spread on 1 cup of the whipped frosting. Now top with 3/4 cup of the cherry filling. Add the second cake layer on first and repeat the process. Top with the third cake layer. Take some whipped frosting and spread around the entire sides of the cake. Next, pat the reserved cake crumbs over the frosting on the sides of the cake. When completed, take the whipped frosting set aside and pack inside a pastry bag with a starred decorator’s tip. Utilizing the starred decorator’s tip, pipe frosting around the bottom and top of the cake. Finally, spoon in the remaining cherry filling into the center of the cake. This may look like a French croissant , but the Israelis have taken these sweet crescents to a whole new level of doughy goodness! 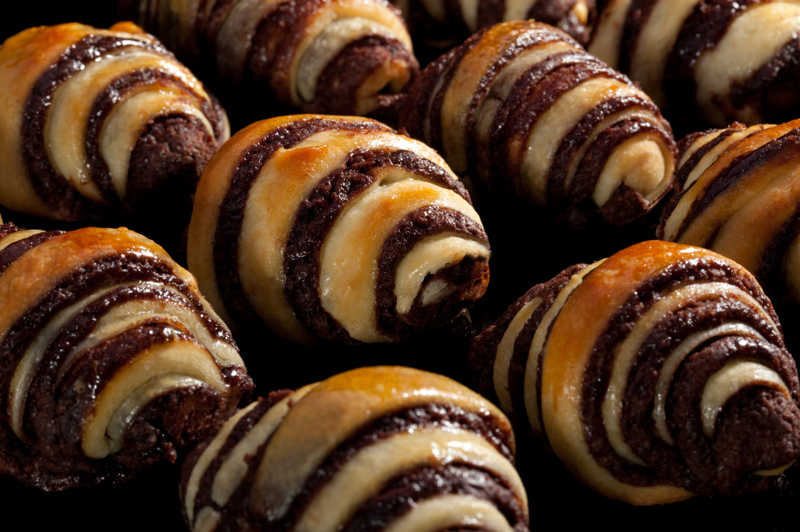 Rugelach, a word in Yiddish meaning “little twists”, is a traditional Jewish pastry that can be eaten at any time of year. Most often these treats are favored on Hanukkah and other religious celebrations. First, in a mixing bowl, cream the butter and cream cheese together. Add sugar and vanilla, mix until smooth. Add flour and mix lightly. Refrigerate dough for at least an hour. Next, preheat oven to 350 degrees. Divide dough into four balls. On a floured surface, using a floured rolling pin, roll one ball out into a circle until it’s about 1/8 inch thick. Next, in small bowl, mix the first four filling ingredients together (cocoa, cinnamon, sugar, grated chocolate). Spread some melted butter on the center of the circle. Sprinkle the chocolate mixture on top. Now cut the pastry into pie-shaped wedges. For bite-sized and aesthetic looking rugelach, the thick end of wedge should be about 1 1/2 inches wide. Start at the wide edge of the wedge and roll the dough up toward the point. Next, line a cookie sheet with parchment paper. Place each pastry, seam side down, on the paper. Brush each pastry with the egg and sugar/cinnamon. The Emirate of Sicily was once an Islamic state that existed in southern Italy from 827 to 902 AD. During this time of Muslim rule, a popular pastry was introduced to the land consisting of a deep-fried doughy tube filled with various sweets. Although the Arabs no longer occupy the land, this scrumptious confection is here to stay. 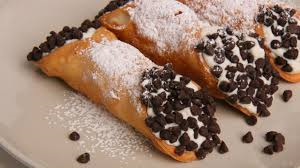 The cannoli, meaning “little tube“, is now every bit Italian as the Pantheon or Vespasian’s Colosseum. First, in a medium bowl mix together the flour, sugar and cinnamon. Cut in the shortening until it is in pieces no larger than peas. Make a well in the center, and pour in the egg, egg yolk, Marsala wine, vinegar and water. Mix with a fork until the dough becomes stiff, then finish it by hand, kneading on a clean surface. Add a bit more water if needed to incorporate all of the dry ingredients. Knead for about 10 minutes, then cover and refrigerate for 1 to 2 hours. Next, divide the cannoli dough into thirds, and flatten each one just enough to get through the pasta machine. Roll the dough through successively thinner settings until you have reached the thinnest setting. Dust lightly with flour if necessary. Place the sheet of dough on a lightly floured surface. Using a form or large glass or bowl, cut out 4 to 5 inch circles. Dust the circles with a light coating of flour. This will help you later in removing the shells from the tubes. Roll dough around cannoli tubes, sealing the edge with a bit of egg white. Now, heat the oil to 375 degrees F (190 degrees C) in a deep-fryer or deep heavy skillet. Fry shells on the tubes a few at a time for 2 to 3 minutes, until golden. Use tongs to turn as needed. Carefully remove using the tongs, and place on a cooling rack set over paper towels. Cool just long enough that you can handle the tubes, then carefully twist the tube to remove the shell. Using a tea towel may help you get a better grip. Wash or wipe off the tubes, and use them for more shells. To make the filling, stir together the ricotta cheese and confectioner’s sugar using a spoon. Fold in the chopped citron and chocolate. Use a pastry bag to pipe into shells, filling from the center to one end, then doing the same from the other side. Dust with additional confectioners’ sugar and grated chocolate for garnish when serving. Green tea has been part of Korean culture for centuries. There are historical documents detailing Emperor Suro and Queen Seondeok enjoying this hot brew. It’s widely believed that Buddhist monks first introduced green tea to the Korean Peninsula upon their arrival from China’s Yunnan province. Because the beverage is so popular in the Land of the morning calm, green tea ice cream tops the list as a summertime favorite. First, in a medium saucepan, whisk together the half and half, sugar and salt. Begin cooking the mixture over medium heat and then add the green tea powder. Stir often. Cook until the mixture starts to foam and is very hot to the touch but not boiling. Next, remove from the heat and transfer the mixture to a bowl sitting in an ice bath. When the mixture is cool, cover with plastic wrap and chill in the refrigerator for 2-3 hours. Once the mixture is thoroughly chilled, transfer to a pre-chilled ice cream maker and churn according to the manufacture’s instructions (20-25 minutes). 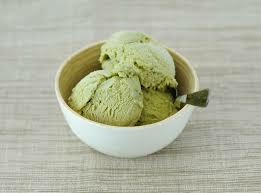 Transfer the soft ice cream into an airtight container and freeze for at least 3 hours before serving. Nothing is more American than baseball and hot apple pie. My babydoll, Rebecca, divulged her Grandma Erna’s family recipe for this star-spangled favorite. Trust me, you won’t want to skip out on this dessert! First, preheat oven to 400 degrees F (204 degrees C). Whisk the flour and salt together in a mixing bowl. Pour oil and milk into one cup (do not stir). Add all at once to flour. Stir until mixed. Press into a ball. Roll out between 2 sheets of wax paper. Place prepared crust into 9 inch pie plate and form edges to fit. In a small bowl, mix together sugar and cinnamon. Place sliced apples in a large bowl and sprinkle with sugar mixture. Toss until apples are thoroughly coated. Spoon apples into pan. Dot apples with butter then cover with top crust. 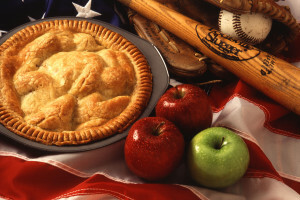 (Seal edges by brushing a little water around the edge of the bottom before placing the top crust. This helps create a good seal once the two are crimped together. Crimp as desired and cut steam vents into top. Bake in preheated oven for 1 hour. Serve warm topped with a scoop of vanilla ice cream. I dedicate this Eastern European cake to my sister-in-law, Daria. Recently, she moved from her homeland in Ukraine to settle down with my brother in the sunshine state of Florida. Daria, here’s to you. I hope this recipe makes you feel just a little bit closer to those loved ones you left at home. First, preheat the oven to 300 F. Next, separate the egg whites and refrigerate them for 12 hours in an airtight container. Then leave the egg whites at room temperature for 12 hours. After waiting the allotted time, beat the egg whites until stiff. While continuing to beat, add 2 tablespoons of vanilla sugar and 1/4 cup of sugar. In a bowl, mix the remaining 1 1/4 cup of sugar, 3/4 cup of flour and 1 1/4 cup of cashew nuts. Fold this mixture gently into the egg whites by lifting it from the bottom of the bowl to the top. Grease two 12-inch molds with removable bottoms and spread half of the meringue mixture into each. Bake for 2 hours and 30 minutes. Carefully unmold and cool the two meringues on a rack for at least 3 hours. In a large nonstick saucepan, combine sugar and milk and bring to a boil. Beat the egg yolks for 5 minutes. The mixture should double in volume. While beating, add half of the hot milk syrup to the egg yolks. Put this mixture into the saucepan with the remaining milk syrup and bring to a boil, stirring constantly. Remove from heat and continue to stir occasionally until cool. Beat butter and vanilla sugar at high speed. While beating, gradually add the milk-egg mixture. Divide the mixture into three equal parts. In the first part, add the cognac and whisk. In the second part, add the cocoa and whisk. The third part will be used for the decoration of the above by mixing with food coloring. Place the first meringue. Spread the cognac cream generously over it and then place the second meringue. Cover the sides and top of cake with the cocoa cream. Cover the sides of the cake with the remaining 1 1/4 cup of cashew nuts. When decorating the cake, use different colors and allow your creativity to be your guide. 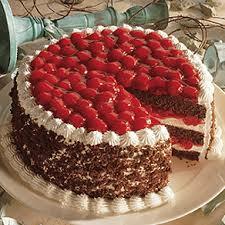 Lastly, refrigerate the cake 4 – 6 hours before serving. This article isn’t complete until you add your own scrumptious confection in the comment section below. When doing so, don’t forget to include its country of origin. Thank you for reading and I hope you visit my site again real soon. Feel free to explore other areas of my blog and share some love on social media.